*Sony/Minolta lens price guide--see below. Hopefully I'll have most completed by the end of June. I'm doing the Minolta teleconverters only because I have them on hand. Also, I'm working on a Sony/Minolta new/used lens price guide, primarily using eBay final selling prices, with plans for updating the page about once a month. This will give you an idea about what the current prices are for the more popular lenses, though not every single lens will be included. I should have the Sony 16-105mm review completed by Tuesday, and I'm comparing it to the Sony CZ 16-80mm, which goes for about $120 more. One other item of note: if you want accurate specifications for your Sony Camera or lenses, don't go to the official Sony website. They give contradictory information between the Specs tab and features tab, and even that info can differ from the specs sheet that comes in the package. I fire off a message occasionally, but nothing changes. 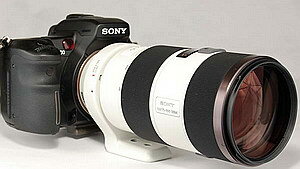 I've completed the Sony 70-200mm F/2.8 G lens review. Actually, there might be some additions, but it most likely will be in the form of a separate page. the reason it took so long is because I want to do some more comparisons, but the review just got completely out of hand and was too long. Have a couple portraits of Cleveland? Order this lens! I've been having a streak of good luck lately. Except the kit telephoto I reviewed earlier, the last few lenses have performed astonishingly well. Click the image or go here for the full review. I'll update the review order and mention new items in the next day or two. Here's the first of several new/old lens reviews coming in the next couple of weeks. We'll start it off with the little Minolta 24mm F/2.8 wide angle lens. This lens turned in a very good performance. 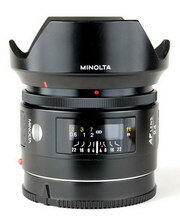 It has the same bacis characteristics as the Minolta 28mm F/2.8, though the 24mm is a little sharper at F/2.8 and F/4. It has low distortion, low CA and currently, a low eBay price. The corners are soft at F/2.8, but that's not really an issue, see review. With the pending full frame body from Sony--read prices going up--this might be a good chance to get one with a low price. It has an equivalent focal length of 36mm on an APS-C sensor, which makes it a nice walk around lens. I used a lens like this exclusively for several years on my Canon A-1 in the 1980s. Prices are now around $150-229. My copy is near flawless, with the original caps and hood. Another conundrum: It looks like I'll have to switch the review order again. 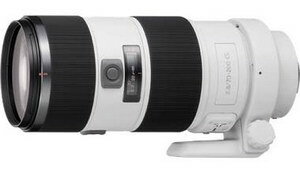 Next up may be the Sony 70-200mm F/2.8 as I'm having trouble with the Sony 16-105mm. It looks like it will be in that order too. I hope to have the Minolta completed late this weekend or early next week, so keep checking back! I still don't have the new 70-300mm F/4.5-5.6 yet. All the stores are back-ordered. I had my order in well over a month ago and apparently that wasn't soon enough. A guy wrote and said he got disgusted waiting for an online order, cancelled it, then found out a local store had a few and bought one. I checked the local stores here and wasn't so lucky. The saga continues. This is the final entry in the Grand Canyon tour series. This time it's a hike from the South Kaibab trail, down to the Colorado river, across the Black bridge, over to Phantom Ranch, across the Silver bridge, then up the Bright Angel trail, all in one day! Go here to hike the Grand Canyon. The hike has 77 colorful photos, on two pages. The first page covers the South Kaibab trail down to the river, the second page Phantom Ranch and up the Bright Angel trail. I used heavy compression, so each page is only about 3.7mb, dial up users rejoice. 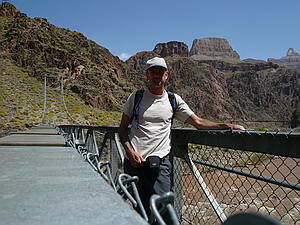 The picture to the right is me on the Silver bridge, at the Colorado river. Click for hiking tour; Rim to River to Rim. Sony users read up: The Sony 70-200mm G F/2.8 that you've been wanting for so long but couldn't afford because it was way too expensive has now been officially lowered--again. The original MSRP was $2399, then less than a year ago it was lowered to $1999. Now the new MSRP is $1799. Check out the SonyStyle.com website and order one. I guess Sony saw my rant last year and decided to adjust the price accordingly. It's obvious they were having trouble selling them, otherwise you don't lower the price. They still need to work on the 300mm F/2.8. If Sony plans to enter the high-end full frame market by the end of the year like they say they are, they're going to have to try to price match Canon and Nikon. So far, the Sony camera bodies are competitive in my opinion.